Noel Shine grew up on the west coast of Clare just a stone’s throw from the mighty Atlantic ocean. The house was steeped in music – his father Jack a fiddler and clarinet player of note while his mother was a fine accordion player. It was only natural that their children would follow suit and Noel was no exception. He took up the whistle at the age of four and was a brilliant player from early on. In his teens he taught himself guitar and began playing with the Moycastle Ceili band around the West Clare area. In the early 70’s he moved to Cork city and became an integral part of the city’s musical life. With his fine whistle playing he slotted right in to the traditional music scene, playing regularly with the best musicians the country had to offer. He began to invest a lot of his creative energy into writing songs and tunes. It was around this time that his friend Chris Twomey had an idea for a band, The Steam Packet Company, that would combine Irish music and American folk and country. They brought onboard another friend, Eoin O Riabhaigh, a fine piper, augmented later by Tom Stephens on bass and Pete Brennan on dobro. The band had much success playing all the best folk festivals in Ireland as well as a longrunning residency in famed folk house The Phoenix Bar. It was during this time that Noel gathered many of his wonderful songs and really honed his guitar picking, the traditional and country tunes testing his mettle and dexterity. He also added mandolin, banjo and bouzouki to his instrumental armoury. 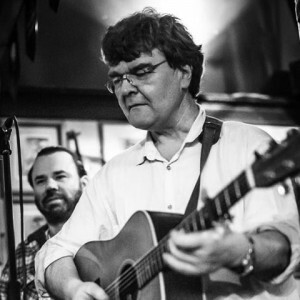 While The Steam Packed took a sabbatical, Noel began playing with Cork songwriter John Spillane who has gone on to carve a wonderful recording and broadcasting career. When John joined The Stargazers, Noel went to play a summer season in The Anchor Bar in Dunmore East where he met Mary Greene, the daughter of the house. She often joined him for a few songs and the partnership, enduring to this day, blossomed into love and marriage. “We did a lot of touring in America, playing in places like McGurk’s in St. Louis and The Plough and the Stars in San Francisco with musicians such as Jackie Daly, Kevin Burke, Manus McGuire, Joe Burke, Anne Conroy, Noel Hill and Tony Linnane and De Danann” Noel and Mary also met many wonderful American musicians and got ample opportunity to immerse themselves in a wonderfully vibrant folk scene, playing sessions and concerts across the states. Great and enduring friendships followed. Since settling in West Cork the duo have been raising their their two girls and doing up their pre famine cottage, all the time never losing sight of the other great love of their life – music. After the release of their second album UNSPOKEN LINES they put together a digital home recording studio and have been working hard getting to grips with the technology. The fruits of their labours can be heard on Mary’s solo debut SEA OF HEARTS which is a collection of original, contemporary songs on which Noel plays a variety of instruments such as acoustic and electric guitar, mandolin, bouzouki, whistle and keyboards. Noel also engineered and edited much of the album. Noel’s musical life has seen him play with a wide variety of acts around the country and on the continent and whenever a traditional band is in need of a fine guitar player and singer, Noel is often on the top of their list to call. He has guested on many fine recordings and has had his songs included on several songwriting compilations. Next up, Noel would love to gather together and record an album of his own original instrumentals. And then, who knows where the musical road will lead…….